“Gee, I’m going to Semarang by train tomorrow. Please come to the train station to see me for the last time. *laugh emojis*” he messaged me on Friday, 19th August 2016 via Line Application. One day in the morning, at 6 o’clock I was already sitting between the train station passenger lounge benches. The situation at the train station was not too crowded in that morning, but it was just my head that was anxious. I had to face the pain in the morning but I tried to cheer myself up. I was sure that there is always the right time for everything in this world to happen. I knew this happened for a good reason, even though I should be separated with one of the people I loved. 15 minutes later I saw the man from the counter ticket in the corner, who was a little hurried while waving at me, then I smiled at him. I was standing and waiting until he came to me. At that moment I could felt the pleasure and pain at the same time. Then he was already standing in front of me. His right hand was grabbing a ticket and the left one was grabbing the handle of his big suitcase. We were going to be separated although we did not want to be separated. I looked at his eyes, then he smiled. “I am sorry. I should have come earlier.” he said as he hugged me tightly. “It’s ok. I just didn’t want to be late.” I said softly. That day, Rizky, my best friend since the first grade of junior high school, was going to Central Java to continue his education at a well-known university in Semarang. He succeeded on the national selection for college, so did I, but I was accepted at also a well-known university in Bandung. I was so happy for him even though I should hide the sadness on my face, because at that time, as his best friend, I had prepared my best smile to let him went away. So, he would not be worried about me being lonely without him. “Ghe, if the distance separates us, just close your eyes. You will always find me in your heart. Hahaha.” He started to make a conversation. As always he really liked to flirt with me, even in this kind of situation. At that moment I felt my heart was pierced. It made me heartbreaking. I thought it would be this hard to have a distance with him. But, the way he talked was like he was going to leave me without any doubt. I didn’t know why my heart beat so fast and it made me awkward in front of him. “Ki, you’re always been there for me for six years, even every day. If I should wait one or two years until you come again, it isn’t a problem, is it?” I laughed and lied my head on his shoulder. I did not want to break our friendship just because of my love feeling toward him. He patted the tip of my head, and laughed slightly. I felt like his laughter was the most soothing laughter for me. “Bandung and Semarang aren’t too far, Ghe. They both are in the Java.” he said. “Yes, but the hard one is when I’m missing you.” I chuckled. Even actually I was annoyed. He was so underestimating the hundred kilometers distance between us. I laughed then raised my head from his shoulder. “Roger, ma’am!” Then we both laughed. He took a deep breath. 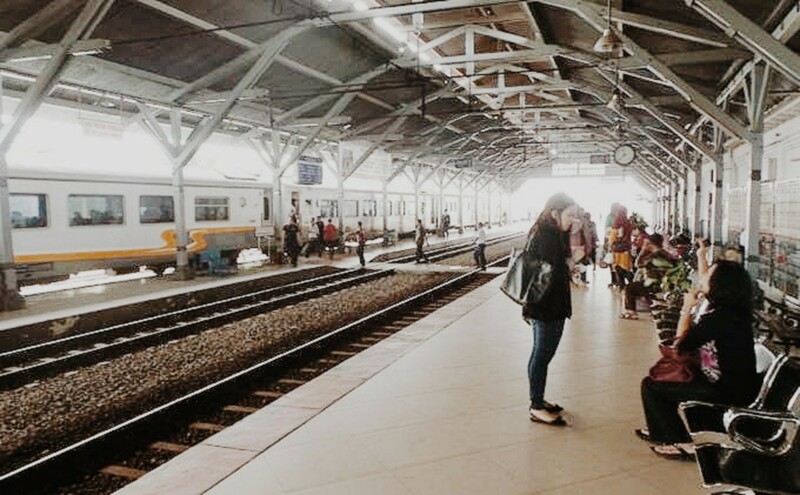 The speakers at the station wall had sounded to announce that the train to Semarang was going to arrive in only ten minutes. The people who were sitting began to get up and waited for the train on the trembling edge of railroad. So did he, he started to check his luggage. I really wanted to cry. I wondered after this separation we wouldn’t talk again. I tried to hold my tears that were about to fell down in my cheeks. Not only I was ready to let him go, but also my feelings toward him. “Hey Ghe, what’s wrong?” He helped me to stand. Then once again he hugged me tightly. I just smiled to hide my pain. “I’m fine. I’m just not ready to let you go with a distance.” I became nervous. I hold back tears and restrain what I wanted to say that I actually loved him. Without saying anything, he just hugged me tightly. This really made me even more hurt. I wondered did he feel the same way as I felt toward him? And could he read my mind? Or did he feel uncomfortable instead, because I acted childish and was hard to accept the fact that my best friend should leave me. Those words that he had said made my heart beats so fast and felt anxious, weak, also got headache. It was obviously that he only loved me as a best friend, but I did love him more than just a best friend. At that moment I felt I hated myself so much. He took off his arms from me. I was just looked down, hidden my face’s reaction after I heard what he just said about his feeling to me. “When I’m back, I will take you to see a sun from the sea with the ship I made.” He smiled, flirted with me again then fixed his glasses that about to drop. Then he grabbed his suitcase and the ticket. “I will wait that day to come.” I smiled back. “Good bye, Gege. Please wait for me. I promise I will meet you again. See you later.” He walked toward the train that has come. He had already inside the train. Then he sat in his seat. At the outside I stood still waiting him to leave on the trembling edge of railroad. “Good bye, Ki!” I said as I waved toward the train where he’s sitting inside. I also added “I love you, Ki. I will miss you.” but silently, I said it to myself. I was not trying to be dramatic, but I was about to cry at that moment. However I still could hold the tears in my eyes and then I also thought what should I worried about, because I would definitely meet him again. Until the time came when the train’s steam boasted from the chimney and began to go off slowly but steady to the south. Once again I waved toward the train for Rizky, my best friend that was leaving me for his dream. I was ready to had 372 kilometers far away from him.